Hi everyone! I'm Amy and I blog over at Mrs. Mommy. As you probably guessed, I write about all things mommy related. I am a SAHM to my two precious babies. 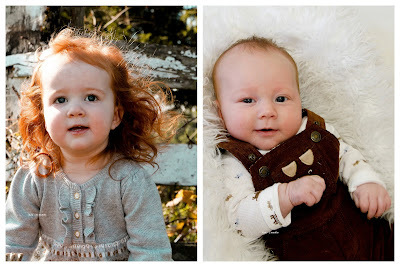 Kyla is 21 months and Kase is 10 weeks! Things can be pretty crazy with two under two, but I wouldn't change a thing! Ok, maybe I would have a few less dirty diapers to change. But I love blogging about it all. Plus a lot of other random topics - reality TV, my love of sports, my attempt at couponing, and whatever else comes to mind at 3 in the morning when I'm feeding my baby. I've gotten really good at typing with one hand! I try to keep it real on my blog. Although I write about how awesome being a mom is and how my kids are the best (every mom thinks their kids are the best, right? ), I also write about the hard times. Like this post where I talk about how I wish I had just 10 minutes to myself each day to take a hot shower. Let's be real, being a mom is amazing. But it's also hard. And I am certainly not perfect. I love the support I get from my readers when I have a bad day or when I need advice. I thought I'd share some things I've learned so far on this motherhood journey. 1. Some days I feel like Super Mom. Both kids are happy. I find time to do Tot School with Kyla. I have dinner on the table when my husband gets home. I love these days! 2. Some days I feel like a complete failure. Both kids are crying. I haven't even thought about what's for dinner when my husband gets home. I haven't showered all day. I feel like I'm on the verge of a breakdown. 3. One of my favorite things to do is to just pack the kids up in the van and go for a drive. And pray that they will fall asleep. If they do, I keep driving. The wasted gas is absolutely worth the peace and quiet. 4. It's ok if they cry. Although I hate when my babies cry, I've come to realize that sometimes it's ok. I can only do so much. 5. Technology can be my friend. Our iPad has been a great investment! Kyla loves it and I allow her about 20 minutes at night if she is well behaved all morning. As soon as she sees that thing being pulled out, she gets so excited. I also have some apps on my phone that I let her play with. Right now she loves a memory game. This can really help when she's striving for attention while I need to feed Kase. 6. Take time for myself. Even if it's only an hour a week. This time away to do something for me is so important for my sanity. It definitely makes me a better mom and wife. Whether it's exercising, shopping, taking a long, hot bath, I need it to re-energize! 7. Rotate toys for the toddler. She gets bored with the same old toys so I try to switch them out each week so they seem "new" to her. I wonder how long I can get away with this? 8. Have support. I have some amazing people in my life. My husband, Tyler, is by far the best Dad in the world. And my mom usually comes over once a week for a couple hours. She usually takes care of Kase so I can spend one on one time with Kyla. It works out great! Not only is it nice to have help with the kids, it's just nice to have someone to visit with. 9. Cherish every moment. I know everyone always says how fast they grow up, but seriously, my baby is almost two! 10. It's ok to bribe the toddler. Yes, I admit it, I have bribed her with a sucker. And just the other day I posted about her getting her way at Target and us leaving with a $20 toy laptop. I am not proud of it, but like I said, I'm keeping it real on my little blog. The stars of my blog! Can any of you relate? What have you learned? I promise I don't only blog about my kids so even if you're not a mom, please still stop by and say hi! In addition to my blog, you can follow along on Facebook and Twitter. Oh, I almost forgot, along with being a full time mom, I am also a Director with Thirty-One Gifts. I kind of love giving away our awesome products so if that's not a good enough reason to visit my blog, I don't know what is! I actually have a giveaway going on right now and one of my other blogger friends is giving away a Target gift card. Stop over and enter! Thanks for having me today Bekah! Haha! This made me laugh! I tell ya being a mom is crazy isn't it? It's everything and nothing like I expected it to be that's for sure!!! Oh and I LOVE 31 stuff! That is awesome that you have two kids who are so close in age. I am sure it is so hard now but they'll have such a close, sweet relationship for their whole lives. I admire everything you do for your kids- I am sure you sacrifice so much for them! Just found your blog and have loved getting to know you better. I'm excited to follow along!